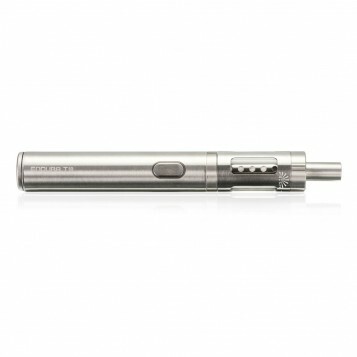 The Endura T18 Starter kit is the newest and best starter kit currently available for new users or those looking to upgrade. 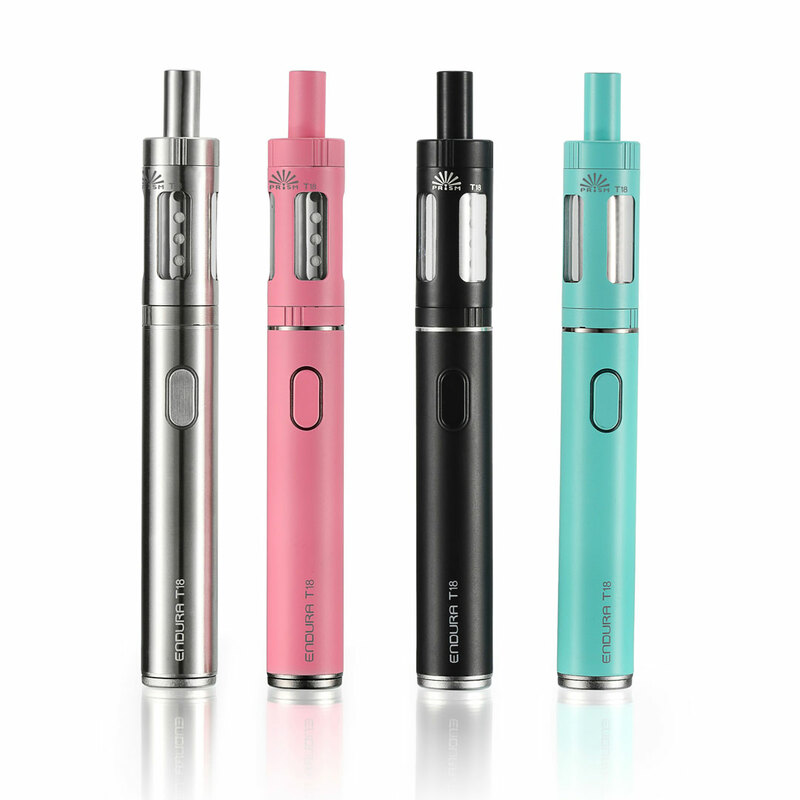 With a stylish design, long battery life, large capacity and great vapour production, the Innokin Endura T18 is the best ever alternative to smoking and now available in the UK. 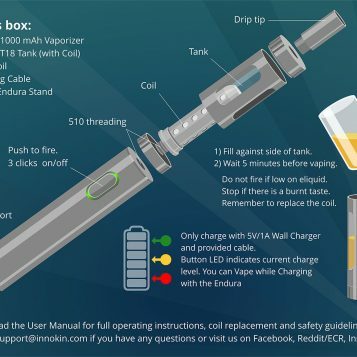 The perfect device for our CigElectric E-liquid including nicotine free. The Innokin Endura T18E Starter Kit brings high performance vaping in a new user friendly design. Perfect for beginners and experienced users alike, this great kit is the perfect start to transition from cigarettes or upgrade from older devices. 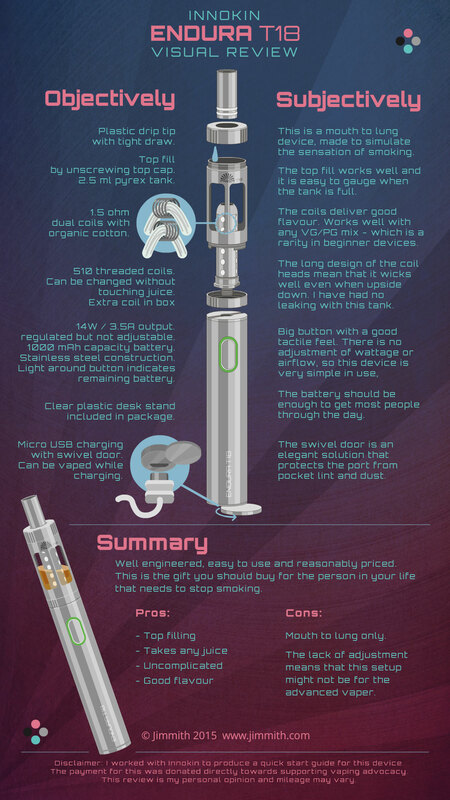 This device has been designed from the ground up, specifically aimed at bringing new vaping design and technology in a new user friendly package. 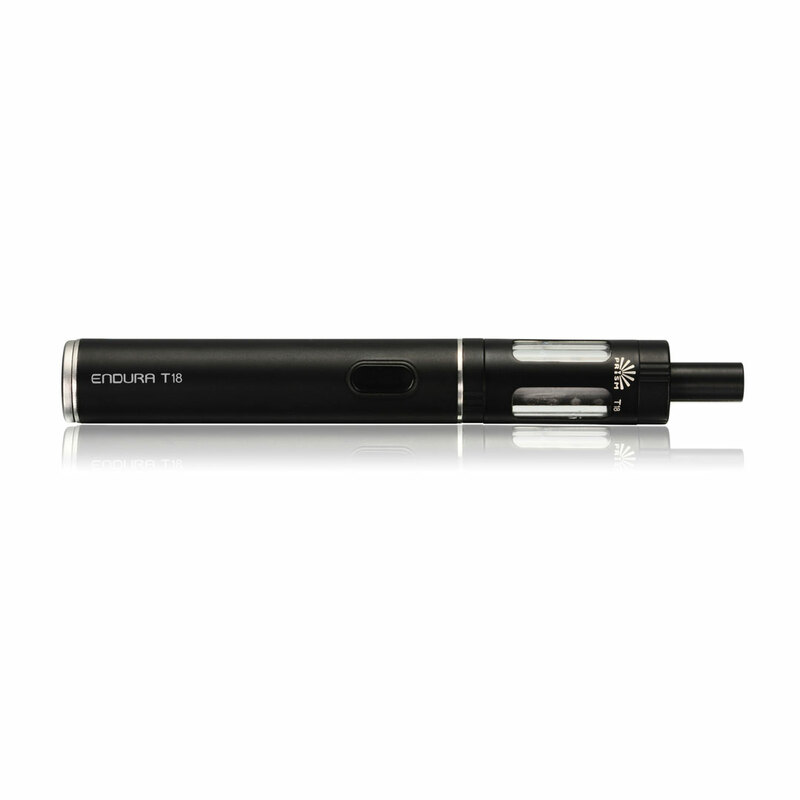 With optimized power output and tank design, the Endura T18E delivers amazing flavour, performance and vapour in a easy to use starter kit. The Prism T18 tank has a small airflow which give a “tight draw” to this device, very similar to smoking a traditional tobacco cigarette therefore making the transition even easier. This is not only the best performing, but also the simplest of devices to use as it features only 1 button, making it a breeze to use without any hassle. This great device is stylish and compact. 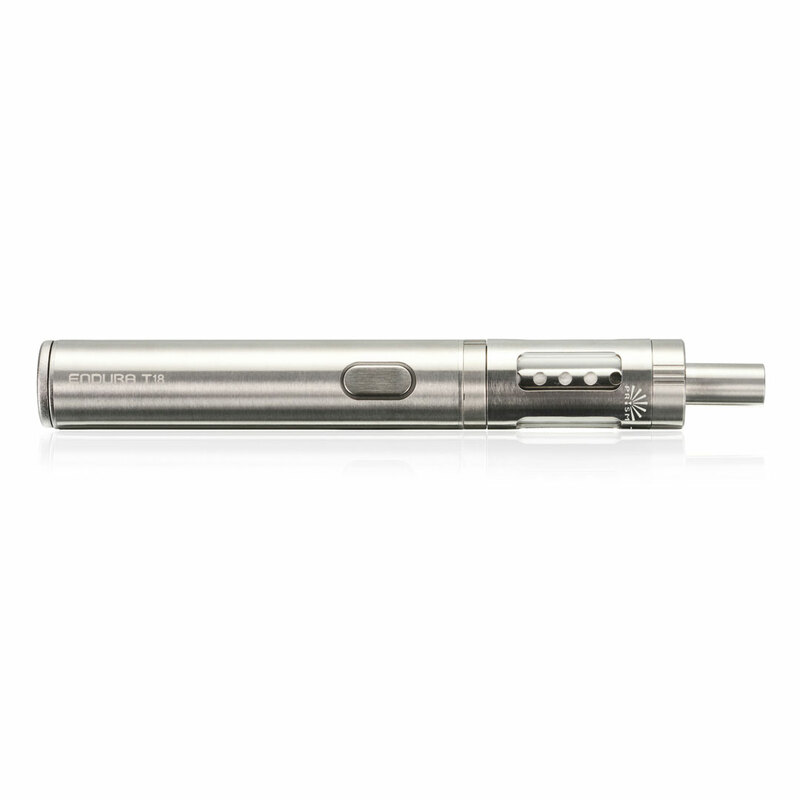 A thickness of 2.4 cm allows discrete vaping and easy to carry. Available in matching battery and tank colours: black, pink, silver and aquamarine. The T18E battery has inbuilt safety protections including overheat, low resistance and low power cut off for battery protection. It utilizes a 1000mah Lithium Ion battery giving a very long life between charges. 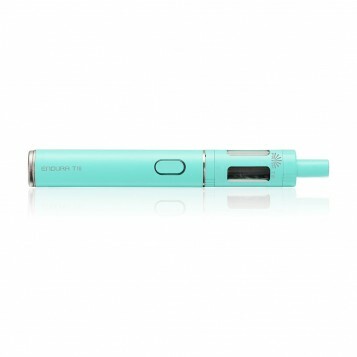 Featuring “vape while charging” technology, this battery can be used even while charging and features a fast and easy re-charge with the micro USB cable included. A 3 click on, 3 click off safety feature means it is easy to carry around worry free. On top of that it has a 10 second automatic cut off for even more safety and protection. 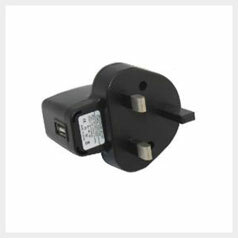 A battery built for ease of use, high performance, long lasting and increased charging safety and reliability. 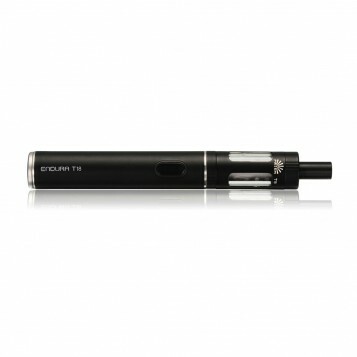 Included with this starter kit is the Prism T18E tank. This “next generation” style tank has an easy to fill, top filling mechanism making refilling your tank quick, easy and clean with very little mess. 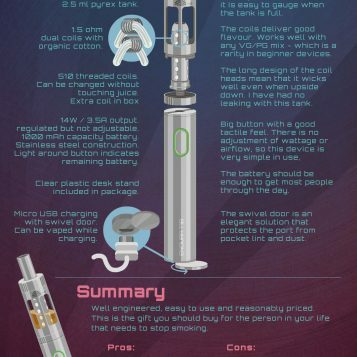 Boasting a capacity of 2.5ml, this tank will go for twice as long as older systems before needing refilling and allows you to vape for longer, hassle free. The Prism tank is constructed with top quality materials to ensure a long lifetime and durability. A Pyrex glass tank window allows you to see your remaining e-liquid level and will not crack even with the strongest of liquids. The rest of the construction is made with stainless steel to ensure it can withstand inevitable knock and bumps, while being easy to clean and long lasting. 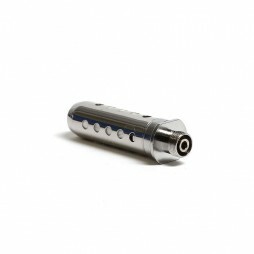 This tank comes with a Prism Coil already installed and 1 extra replacement coil included. These coils are optimized with a fixed resistance of 1.5ohm to deliver 14W of power meaning that the Endra T18E makes plenty of vapour without the hassle of having to play around with resistances and power output. They feature Japanese organic cotton wicking material which is widely regarded as the best material to use for delivering maximum flavour and vapour from your e-liquid of choice. 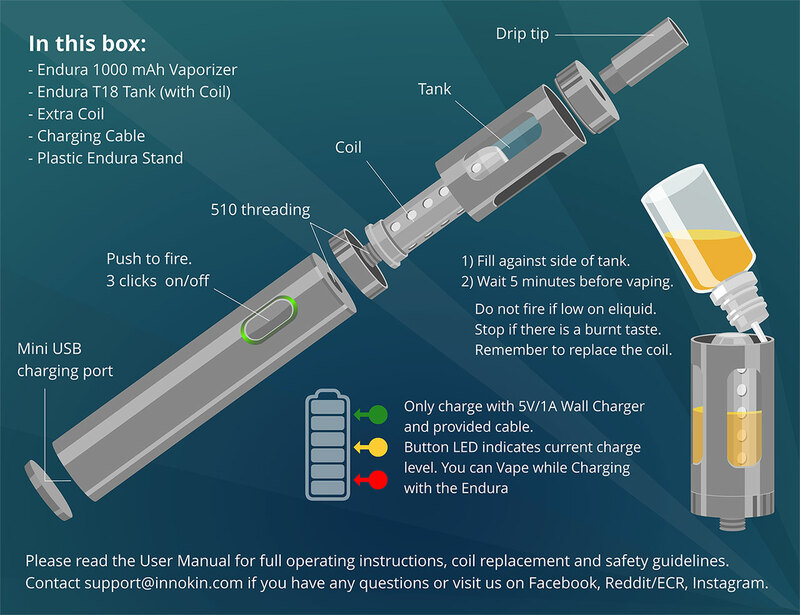 A quick and easy micro USB charging cable for fast and reliable charging, display stand for holding your e-cig on your desk or when not in use and a comprehensive user manual explaining everything from first use and set up of the device to maintenance and safety. This starter kit is covered by Innokin’s 90 day limited warranty and our own CigElectric 30 day warranty (excluding replacement coils). Replacement Prism T18E coils available here. Full independent video review of the Endura T18 Starter kit here.